Dance Centre Kenya (DCK) is pleased to announce our first ever full-length production of William Shakespeare’s A Midsummer Night’s Dream. 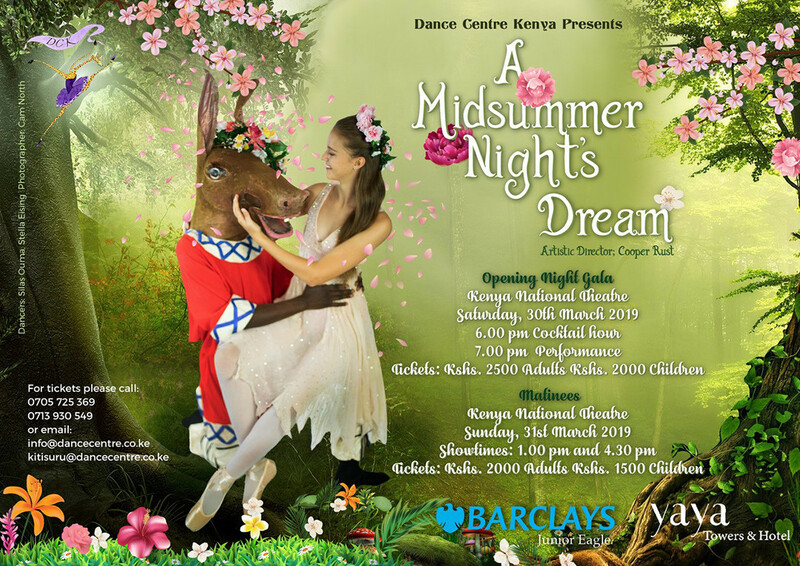 This Shakespearean classic will provide the 65 members of Dance Centre Kenya’s elite Ballet Company the opportunity to showcase their talent, while giving young and old audience members alike an opportunity to witness a spectacular event and be whisked away to the land of magic and fairytale. The proceeds from these performances will go to the DCK Sponsorship Programme. For one hour before both Sunday matinee performances Titania herself will be holding a Rose Petal Party where all of the young audience members will have the opportunity to do a backstage tour and see the beautiful sets, costumes, and dancers as they prepare for the performance, as well as have their picture taken with some of the cast members. They will be given a cupcake and have the opportunity to get the autographs of the stars of the ballet. Since its inception in 2015, a cornerstone of Dance Centre Kenya’s mission to spread dance throughout East Africa is to include those who come from an underprivileged background. In this cast more than 15% of the performers come from humble means, but the audience would never know, as we are a united team of dancers. With two new backdrops from renowned visual artist Naomi Wambui Mwai and all new costumes and sets created by the team at Dance Centre Kenya and Palacina Interiors, the sheer magic of theatre will come to life through the elegant medium of ballet this March. For more information, you can contact the Hardy Studio location on 0705 725369 or Lavington Studio location on 0796 370937.